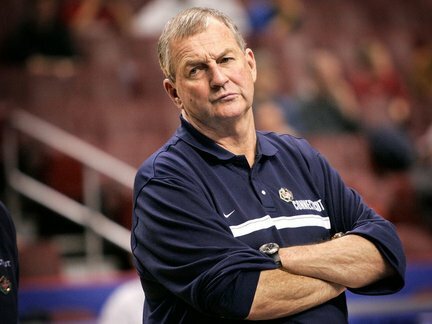 Jim Calhoun's squad has been rather impressive thus far, but do they have what it takes to win? At first glance, it may not seem all that surprising that the Connecticut Huskies are back in the Elite Eight for the tenth time in school history. UConn has been ranked for much of the season. The Huskies have a candidate for national player of the year, not to mention a hall of fame coach. They have a history of coming through in big games. But until now, all has not been rosy in Storrs during the 2010-11 campaign. Flash back to earlier this year. The NCAA came down hard on Jim Calhoun, citing the head coach’s failure to create an atmosphere of compliance within the program. As a result, he will serve a three-game suspension at the start of conference play next year. UConn has also been placed on three years’ probation, but is not banned from appearing in the postseason. The sanctions coincided with the team’s struggles down the stretch. The Huskies lost four of their last five regular-season games, and seven of eleven overall. That’s not exactly confidence-inspiring basketball to a legion of fans in a state where college basketball is king. The Huskies were the #9 seed entering the Big East Tournament. That’s where everything changed. UConn went on to win the conference tournament, winning five games in five days. The Huskies earned the #3 seed in the West Regional. A lot of the pundits wondered, would they be tired after playing five spirited games in a row at Madison Square Garden? They started their tourney journey in Washington, D.C., knocking off Bucknell and Big East foe Cincinnati. They stayed alive by knocking off #2 seed San Diego State Thursday night in front of a pro-Aztec crowd in Anaheim. To study UConn’s success, you don’t have to look much further than Kemba Walker, who has practically single-handedly put his team on his back during the current eight-game winning streak. He’s scored 33 and 36 points, respectively, in the last two NCAA games. He has made one big shot after another; who could forget his buzzer-beating jumper against Pittsburgh in the Big East quarterfinals? And so here are the Huskies, on the brink of their fourth trip to the Final Four. The West Regional suits them just fine. That’s the regional they came out of each of the three previous times. In 1999 and 2004, they won the national championship. The only standing in their way is an equally-hot Arizona team. Don’t think for a moment the Wildcats didn’t raise a few eyebrows with their second half performance against Duke. They emphatically made sure the Blue Devils would not repeat as national champions. UConn is red-hot right now. And in a tournament where two of the #1 seeds have fallen, the Huskies have as good a chance as anyone to cut down the nets in Houston.